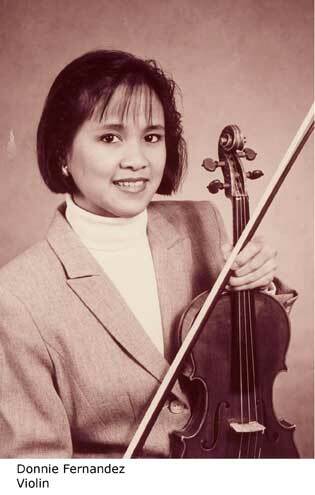 Music performed by the late Filipina violinist Dionisia “Donnie” Fernandez will be featured in Culture Carousel, a classical music radio program, produced by the Cultural Center of the Philippines and aired over 98.7 DZFE-FM on March 26, 2011 at 12nn. The show is a tribute to Donnie Fernandez, one of the Philippines’ most gifted classical musicians. She died on January 15, 2011 in New York, USA. The whole US Army Orchestra and all-male chorale of the US Army performed during the necrological service. She was given full military honors. Donnie began studying violin at the age of 7. At the age of 8, she won first prize for solo instrument at the Philippines’ National Music Competition for Young Artists and was later named a Scholar of the Young Artists Foundation. She earned the nickname “Little Vivaldi” at the age of 10 and was lauded as “The Little Violinist Who Charmed Van Cliburn” before she had outgrown her half-size violin. She was also the youngest member of the Youth Orchestra of the University of the Philippines Conservatory when she moved to the United States to attend the Juilliard School of Music’s pre-college division. She was awarded both a Tito Puente Scholarship and a Juilliard Scholarship to attend school in New York. At Juilliard, she studied under Louise Behrend and the legendary Joseph Fuchs, while she completed both a bachelor’s and a master’s degree in music. After Juilliard, she pursued post-graduate training under Syoko Aki at the Yale College of Music and Felix Galimir at the Mannes School. During her career, Donnie was a featured soloist of several orchestras, including the Jacksonville Symphony Orchestra, the Philippine Philharmonic Orchestra, and the U.S. Army Orchestra. She gave recitals at Carnegie Hall’s Weill Recital Hall, and the Kennedy Center, and performed frequently with smaller, chamber ensembles. Donnie joined the U.S. Army Orchestra and served as its Assistant Concertmaster, with the rank of Sergeant First Class, at the time of her death. As a member of the Army Orchestra, she played for every U.S. president and former president since Gerald Ford. She also performed with the National Symphony Orchestra and the National Chamber Orchestra, and attended prestigious music festivals around the globe, including Tanglewood, the Schleswig-Holstein Musik Festival, and the Blossom Music Festival. The greatest conductors in the world led her - giants like Bernstein, Ozawa, Slatkin, and Eschenbach - but she provided the music that lingered in the mind long after the applause and the ovations. Donnie is survived by her husband, Dr. Walter Belleza, a physician from Fulton, Maryland, and two daughters. She is also survived by her mother, Encarnita Fernandez of Quezon City, and four siblings: Dena Fernandez, a concert marimbist and violist with the Philippine Philharmonic Orchestra; Gertrudis Boboan; Jojit Fernandez; and Dr. Raymund Fernandez. To honor Donnie’s memory and to help other talented young musicians attend musical programs in the United States, the family has established a Musical Scholarship Fund in her name. Cultural Carousel is a weekly radio program of the CCP aired over 98.7 DZFE-FM from 12NN to 1PM on Saturdays showcasing the works and performances of outstanding Filipino and foreign artists. It is hosted by Irene Obligacion – Rada, CCP Public Relations and Linkages Director. For more information, please call CCP PRLD at 832-1125.